Boat bottom paint provides your boat with a protective coating against growth. 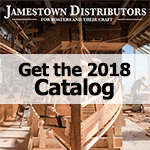 Jamestown Distributors carries Interlux, AwlGrip (AwlStar), Pettit and Durepox bottom paints designed for use on both sailboats and powerboats, with paints available for both fresh water and salt water environments. We carry ablative, hard-epoxy, slime-resistant and gelcoat bottom finishes for both the do-it-yourselfer and the professional. Take care of your investment; treat your boat with a top-of-the line bottom coating from Jamestown. Why is choosing the right bottom paint for your boat so important? Safety is one of the reasons. Heavy fouling growth reduces the responsiveness of the craft and makes it sit lower in the water. This can have serious implications in challenging weather conditions. Protecting your boat's hull is another reason. Prolonged fouling growth will damage the substrate of the hull. For example, the natural glues marine organisms use to attach to the hull damage wood and fiberglass. A third reason to ensure your boat's bottom coating is in acceptable condition is speed and efficiency, as fouling causes drag, which slows you down and increases fuel costs. Fouling, the enemy of all bottom paints, generally has one or more of three primary causes. Animal fouling is when organisms such as zebra mussels or barnacles attach themselves to the hull. This is a frequent occurrence with boats that spend a lot of time sitting static. Plant fouling occurs when weeds attach themselves to the hull. This usually happens around the waterline. Slime fouling is when algae gathers and blooms (blossoms) on the hull. Slime fouling is the worst thing that can happen to your boat's bottom. Notice that different kinds of bottom paint have different compositions targeted at treating these types of fouling. Cuprous oxides and biocides are the two most popular chemical compounds used to combat growth. Bottom paints are also formulated differently depending on the usage of the boat. Boats that are raced, hauled and relaunched, spend considerable time sitting static, are used in warmer or colder waters etc all have bottom paints that are designed with those specific applications in mind. SELF-POLISHING COPOLYMERS: SPC technology antifoulings work because the film contains a patented resin called an SPC Copolymer. This copolymer reacts with saltwater in a controlled way. As a result, the chemical reactions controls and sustains the release of biocides throughout the lifetime of the antifouling without decline. This chemical reaction will take place at the same rate whether you boat is underway or sitting at the dock. This type of technology has previously only been available in tin-based copolymer coatings, which are restricted in their use to boats over 82 feet in length. This new, patented Interlux technology is available for professional application to boats of all sizes. It is not recommended for use in fresh water. Micron 66 is a good example of this kind of bottom paint. CONTROLLED SOLUBILITY COPOLYMERS - These types of antifoulings are partially soluble which means that as water passes across the surface of the coating, it wears down much like a bar of soap would wear away. The physical action of the water over the surface steadily reduces the thickness of the paint at a controlled rate, which results in always having fresh biocide at the surface of the paint throughout the season. For this reason these types of antifoulings have the capability to perform in the areas of highest fouling challenge. Since the biocides are chemically bound to Controlled Solubility Copolymers they can be hauled and relaunched without repainting as the longevity these coatings are related to the thickness of the paint. Micron Extra with Biolux or Micron CSC are good examles of controlled solubility copolymer antifoulings. ABLATIVE ANTIFOULINGS -Ablative Antifoulings wear away with use, which reduces paint build-up. This reduces the maintenance and preparation needed when it is time to apply more antifouling paint and ends the annual ritual of sanding. Ablative Antifoulings, such as Fiberglass Bottomkote ACT not only provide excellent antifouling properties but also can be applied over most other antifouling paints. Fiberglass Bottomkote ACT is an ablative antifouling. HARD ANTIFOULINGS - The technical term for these types of antifouling paints is contact leaching. The paint dries to a porous film that is packed with biocides, which leach out on contact with water to prevent fouling growth. This leaching is chemically designed to release biocide throughout the season, but the amount will steadily decrease until there is not enough biocide coming out of the paint film to maintain fouling protection. Once the biocide is exhausted, the hard paint film remains on the boat. Hard antifoulings do not retain their antifouling ability out of the water and cannot be hauled and relaunched without repainting. One of the main benefits of this type of antifouling is its resistance to abrasion and rubbing. This makes it ideal for fast powerboats, racing sailboats or boats where the owners have the bottoms scrubbed regularly. Most hard antifouling paints can be wet sanded and burnished prior to launch to reduce drag and improve hull speed.